Campbell University presents "Recovering Hope Conference"
Name: Campbell University presents "Recovering Hope Conference"
Like other parts of the country, Harnett County and the surrounding counties are experiencing an increase in opioid related overdoses and deaths. On October 11, Campbell University will host the Recovering Hope Conference for faith leaders to provide information regarding the opioid epidemic and resources to prevent and intervene in this crisis. 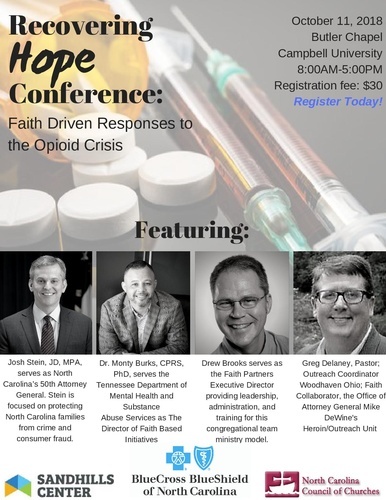 The one-day conference will feature plenary speaker, NC Attorney General Josh Stein as well as breakout sessions featuring leaders of faith based initiatives. The cost for the event is $30 and includes lunch. You can register on-line here. To learn more about the speakers and the sponsoring agencies, see the flyer. If you have questions, contact Nancy Guy, Campbell University School of Osteopathic Medicine at guy@campbell.edu or 910-893-7960.